This aerial picture is from the 1950’s. I love it because it shows us Mud Hollow so very clearly. 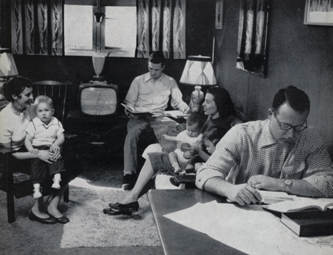 Mud Hollow was Wabash’s version of a veteran’s village to accommodate the men who attended Wabash with their families. It was also home to very new, very young faculty members at times including Vic and Marian Powell and Lew and Mary Ann Salter. For reference, this image was taken from a plane flying over the Chapel. The top of the photo is south and the line through the middle is the Big Four Railroad. As we can see the baseball field was where we now have parking for the Allen Center. The Lambda Chi house is hidden by the trees. The circle at the upper right of this photo is the Sycamore Hills addition as it is just being developed. 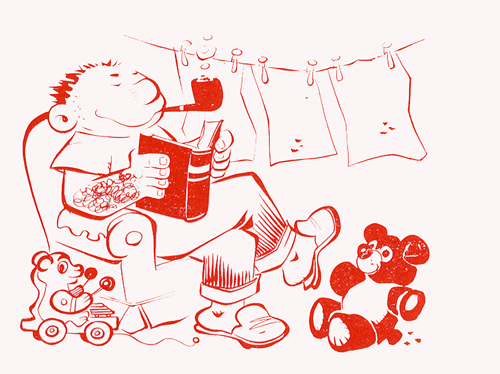 This image is one of a series of brilliant cartoons created by Don Cole [W1952] for the 1956 yearbook. This is the original Wally Wabash in his new role as a resident of Mud Hollow. Here is a photo of a couple of real Wallys as they study. The caption notes that these are the Chuck Preston and Pete Hodges families, again this image is from the 1956 yearbook. The view of the Mud Hollow site is very interesting to me. I played from ’72 to ’75 and the baseball field was located at the current site. When did the houses disappear? The infield was pretty smooth during my years which leads me to speculate that some time had passed between the demolition of the houses and 1972. It also occurs to me that some of the home runs I gave up might have cleared the chapel or Goodrich.